We weren’t disapponted: It had a shiny golden colour with a touch of orange, a slightly nut-like nose without any age note, which is impressive for a wine that old. On the palate it was refreshing with perfect balance between fruitiness and acidity. The freshness emanated from a mint and herb note but it also had an elegant walnut note with slight tones of bitter-orange. It was a nice start despite a slight cork taste which appeared when the wine got warmer. We agreed it must be a Riesling Auslese hidden in this mistery bottle; but where from? We will never know. 93 points. 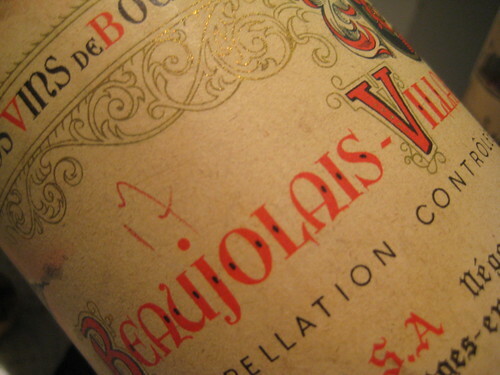 Next was a 1961 Beaujolais Villages from an unknown négociant . 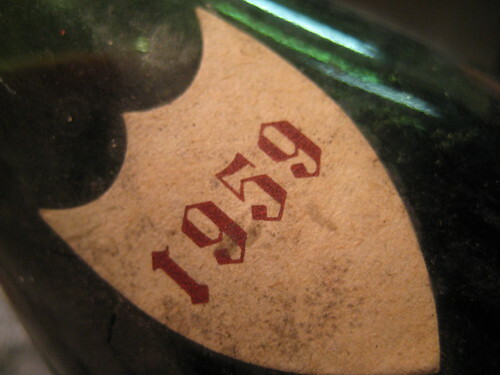 1961 was a good vintage throughout Burgundy, and I read several times that aged Beaujolais can be real treasures which come for a friendly price. Unfortunately, we weren’t lucky with this bottle: frowsty nose with vinegar touch. Maybe a hint of raspberry on the palate, but then again merely vinegar notes. Just not good anymore. 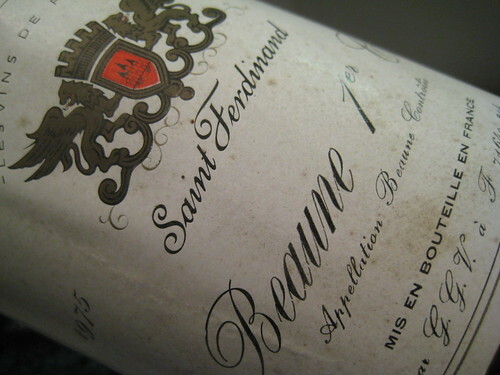 Somehow I mixed up the bottles and we carried on with a 1975 Beaune 1er Cru from Ets Ferdinand, even though there were 2 older bottles from 1967 and 1972. Anyway, we wanted to know how that one would compare to the Hospices de Beaune. 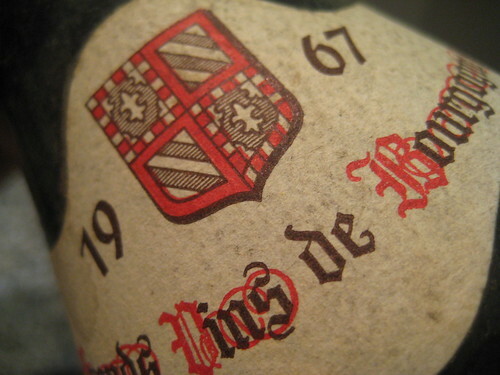 Both are Grand Cru wines from Beaune, but with the difference that, according annals, 1959 was an exceptional vintage and 1975 a pretty mediocre one. 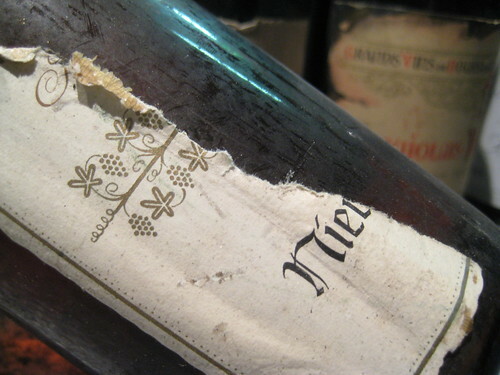 Luckily this bottle proved that bad vintages can also bring up excellent bottles. It had a shiny and intense red colour. The nose was at first a little blunt, but opened up after a while with scents of red berries, raspberries and liquorice. On the palate it was very intense, with a dense structure, a nice sweet note reminding raspberries, several layers of aromas with liquorice, brambles, lots of depth. A powerful wine yet balanced with a superb finish. 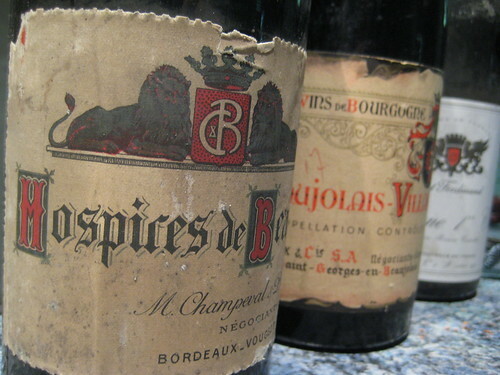 It made the 1959 Hospice de Beaune look really old (which it was of course) and was the king of the tasting. I would rate it a 94+. Then a 1964 Mercurey, which is located in the Côte Châlonnaise, south of the Côte D’Or. The wine came out with a blurry red colour, without any signs of age. The nose was rather earthy with hints of berries. On the palate very balanced and elegant, uncomplicated and nicely drinkable, with a little red berries and light tannins. Maybe it lacked a bit of personality, especially compared to the previous wine (and also to the next one). But still a nice bottle with its 43 years of age. 88 points for me. Finally we opened our last bottle. 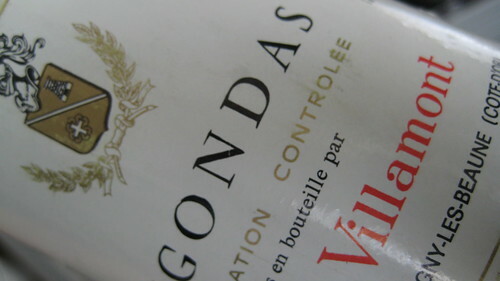 A 1972 Gigondas from Henri de Villamont which we already tried before here. Obviously this isn’t a Burgundy, but why not check how a Rhône wine from a rather good vintage compares to them? It had a nice dark colour, but not as dark as the Beaune 1er Cru. The nose was peppery and spicy with berry-notes. On the palate it was very dense and had a lot of power. 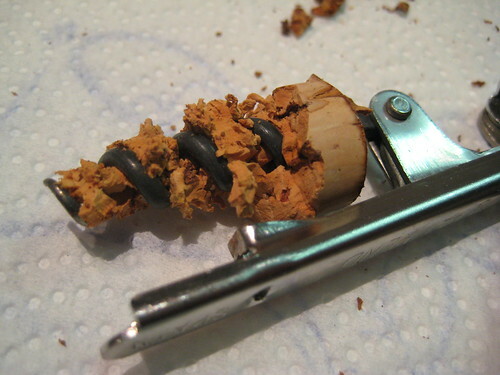 Tannins were quite astringent which even intensified with time and became a bit too much in the end. It had a nice length and was all in all way better than the first bottle we tried of this wine. 90 points here. This was a pretty satisfying wine tasting. First because we had lots of fun with Oskar and my dad, but also because nearly all bottles were in good shape; I only had a hard time opening them as you can see on the last picture :). Hopefully we won’t wait as long for the next tasting! Very nice summary of this wine tasting. The next one for christmas? I’m quite sure that the white wine was from Nierstein/Hessen-Rhenania. The Rieslings from that area are less acid -which was the case- than those from Mosella region or from Rheingau. The pictures all look so inviting, I love the look of old labels, you just never know what lies behind them and you have to find out.